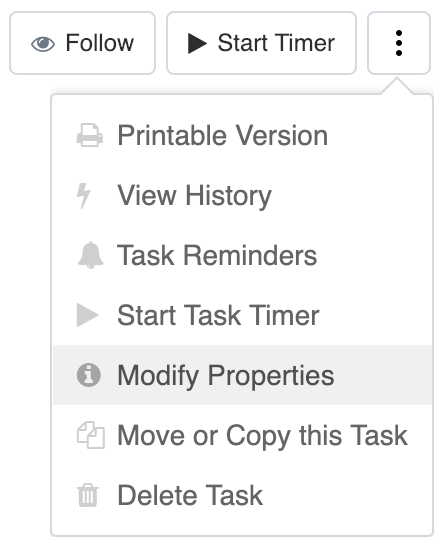 Within Teamwork Projects, you can edit the date a task has been completed if you have the permissions to do so. This is useful if a task was completed on a date before the due date but not marked as complete till a later time. Both the date completed and the person who completed a task can be edited from the task details page. To do this, go to the Everything area of your site, and select the Completed Tasks section. You will see a list of all completed tasks on the project. Select the one you wish to edit from the list, to bring you to the task details view. Once you are viewing the task there are two areas where you can modify the properties of the task. First, you can choose the options button (three dots) to the far right of the page and select Modify Properties. Secondly, you can choose the modify option which can be found in the left pane next to Date Completed. When you choose either of these, you will be presented with a pop up modal which allows you to change the following details. Change the person who created this task. Change the person who completed this task. Change the date this task was created. Once you have chosen your new details, select Apply Changes to save the details of the task change. Note: Only administrators can edit the completion details.